Template time! Movies get template reviews when I don’t have the time or energy or concern about writing them something longer. It doesn’t mean I don’t love them (but sometimes it does). Template reviews contain no spoilers. If no link appears to a longer review around this sentence, I haven’t written one. 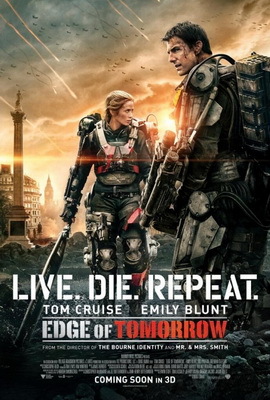 Name: Edge of Tomorrow, or, occasionally, Live Die Repeat. It’s a strange thing. Basic blurb: Tom Cruise and Emily Blunt do remarkably smart blockbuster scifi.